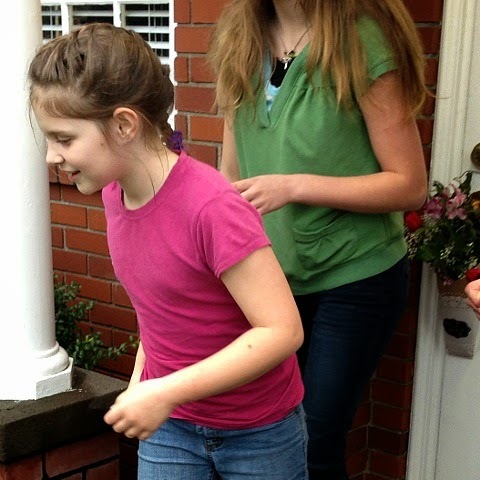 How to help your kids celebrate Spring with a May Day tradition. Surprise friends and neighbors with a May basket! A lovely (and secret) gift your family can make together. 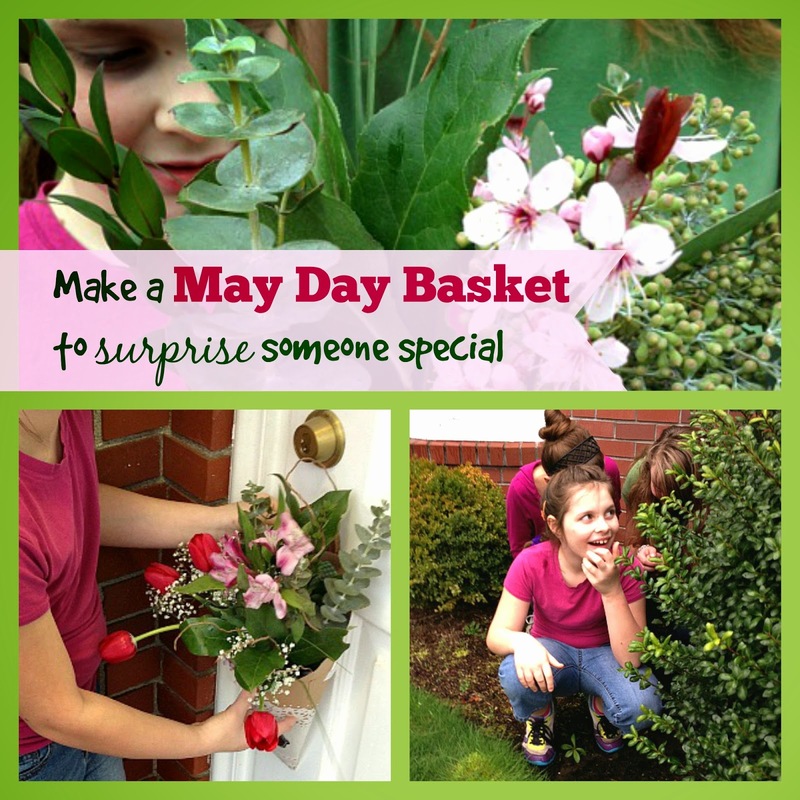 In this article I will show you how to make a May Day basket filled with flowers to celebrate spring and then go a-Maying in your community to bring joy to someone's day. May Day is a holiday celebrated around the world on May 1. It's especially fun for kids, since it involves making special baskets of flowers and mysteriously delivering them to friends and neighbors. Going a-Maying is a fantastic way to get your kids face-to-face with all the budding, blossoming, good-smelling beauty of spring. You've heard the saying, "stop and smell the roses." This activity has you literally stop and smell the flowers, gather them, put them in a special basket and secretly deliver them. What's "springier" than that? May Day is an opportunity for you and your kids to reach out to your community. Though this holiday is not as widely celebrated in America as it once was, there's a good chance the older people near you know all about going a-Maying. Through this activity, younger people will learn about it too. The most important part: a May basket from your kids will surely make someone's day! And practicing and sharing this spring ritual can help ensure this beautiful tradition continues into the future. May Day is part of America's European heritage. It stems back to Rome and their annual Festival of Flora. This celebration of the summer solstice--and the new growing season--was a time of joy and hope after a long winter. The way people celebrate has evolved over time to include Maypole dancing, electing a May Queen and King for your town and going a-Maying. But is got up, and gone to bring in May." Historically, when people would go a-Maying, they'd head out to the woods and fields to pick flowers, herbs, greens, sprigs and twigs, and collect them into baskets. Then they'd decorate their houses and the houses of their friends and neighbors with their literal "gathering of spring." 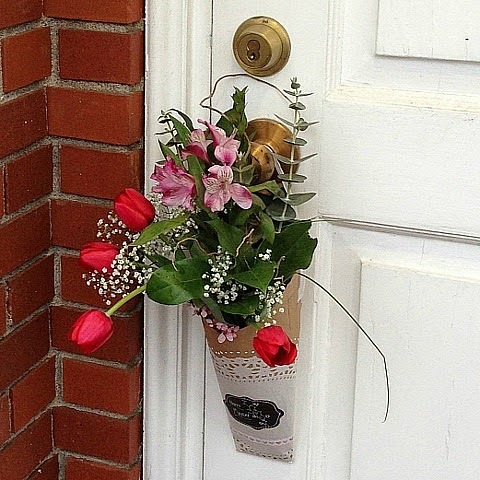 This is where the tradition of making May baskets and leaving them on others' doorsteps started. When I was a girl growing up on a farm, my sisters and I loved this fun spring tradition. 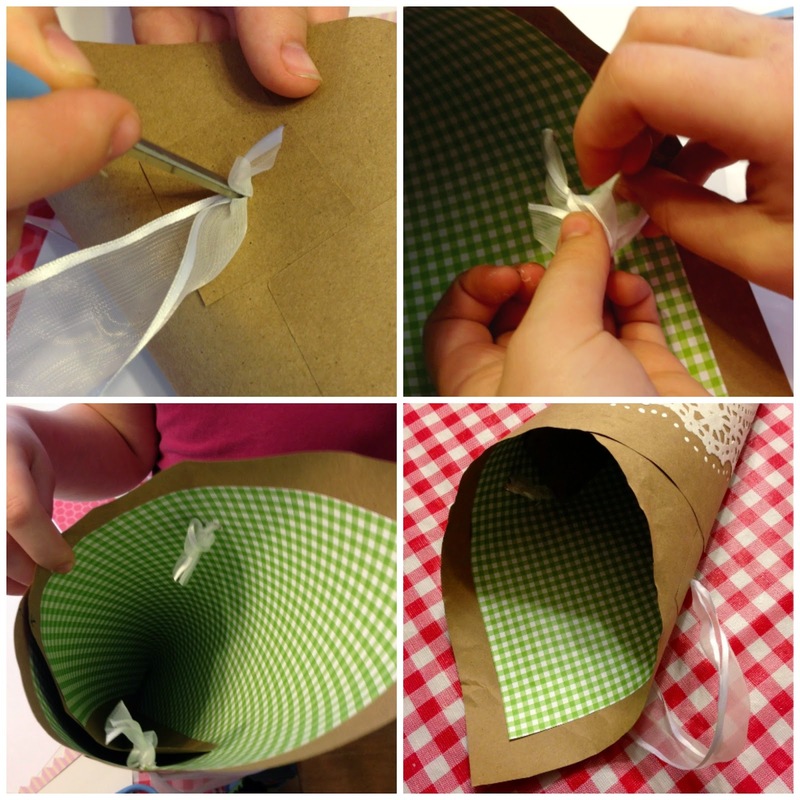 On May 1, our mother always helped us make paper baskets called tussie-mussies or nosegays. Then we went for a walk to pick flowers and other pretty vegetation that grew along our riverbank. Spring. Flowers. Spreading cheer in your community. These things make May Day the perfect family tradition. of craft supplies for this project. 30 minutes for a nature walk to collect flowers and greens. 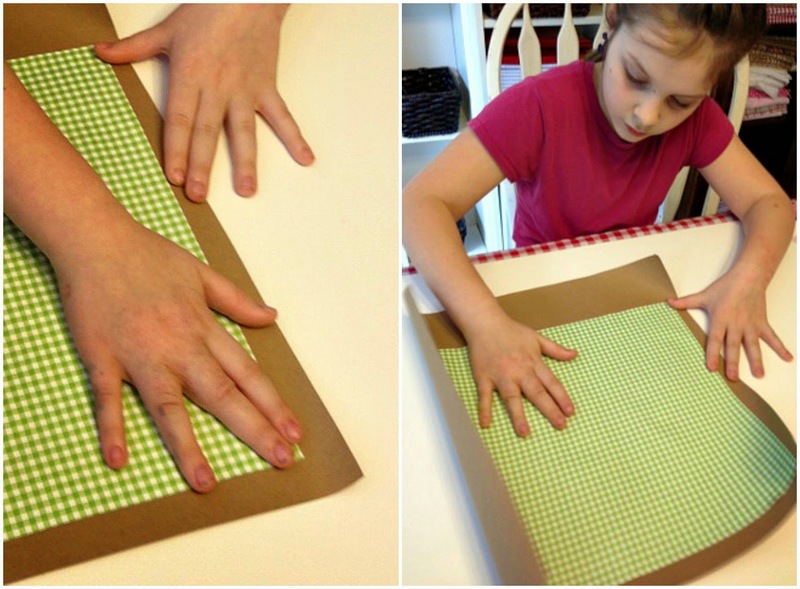 To make a tussie-mussie, cut a 15 X 15 inch (38 X 38 cm) square of heavy brown paper from the roll. Lay it face up so the curl rolls inward (toward the center). This curling will greatly help you form the cone shape you want. Note: The "rollie-pollie" nature of the paper can make these first steps awkward, so you may need to give your child some extra help. Next, glue a 12 X 12 inch (30 X 30 cm) piece of scrapbook paper in the left upper corner, leaving a 1-inch (2.5 cm) border of brown paper on the left and top edges. 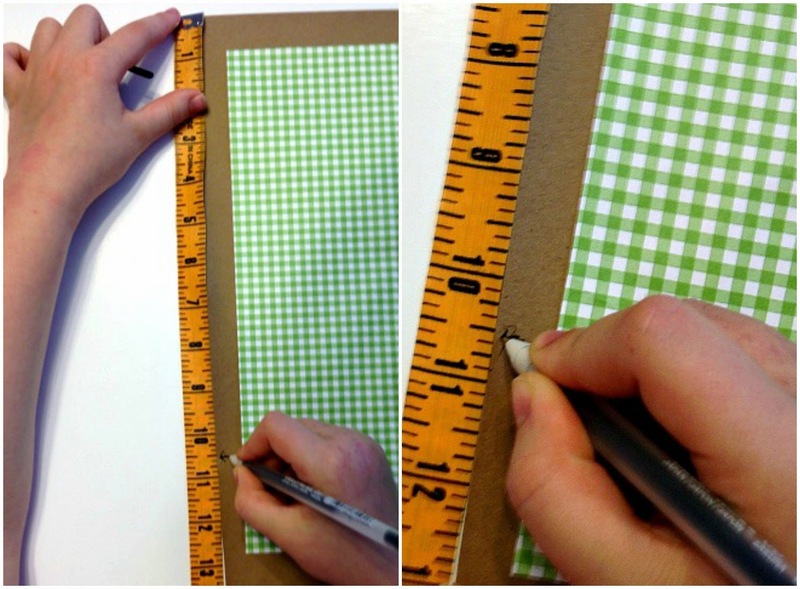 The bottom and right borders should be about 2 inches (5 cm) wide. spring color to your May basket. From the top left corner, measure 10 1/2 inches (26 cm) down the left side and mark the spot. Repeat this step on the top edge, measuring from the top left corner 10 1/2 inches (26 cm) to the right. Mark this spot, too. at the front of the cone. Roll the paper so the left and right sides meet at the two places you just marked. If you match these marks, it'll help center the V-shaped opening at the front of the cone. Pinch this spot with one hand, while gently squeezing the rest of the roll into a neat cone. The narrow end should come together, leaving little or no hole at the bottom. However, a small opening is fine, because you'll be trimming and folding this part soon. Now, turn the cone face-down to expose the seam for gluing. Again, these last couple of steps require a little extra parent help. 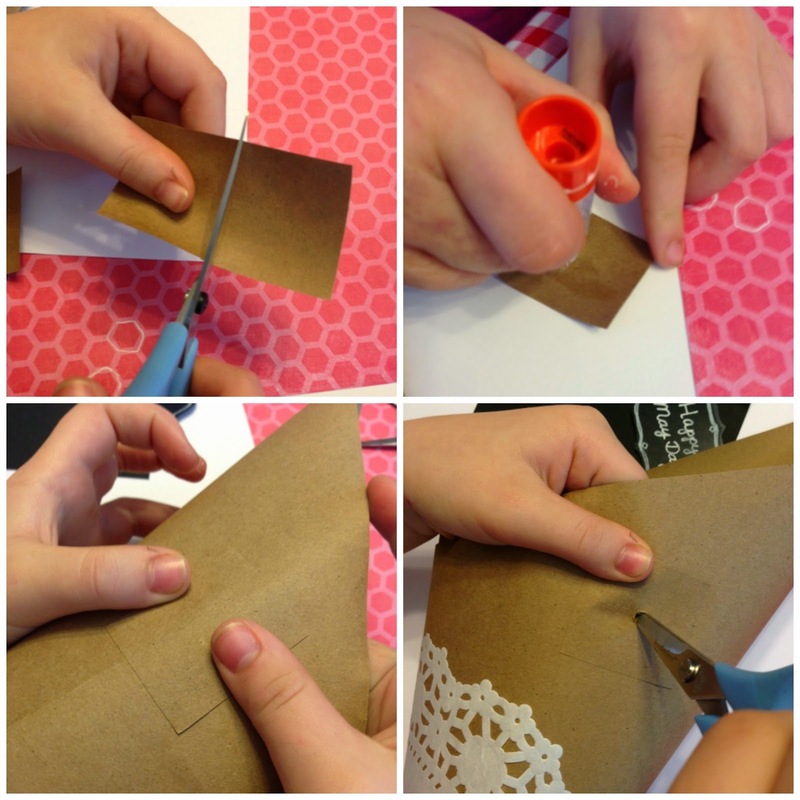 Your kids may need you to hold the cone together while they spread glue on the exposed edge of the roll. Press the glued seam from the inside of the cone until it holds. roll into a neat cone. To close the bottom of the cone, measure 5 inches (12 cm) from the narrow end, then cut straight across. Fold the cut edge toward the back and glue (or tape or staple) in place. This end will be covered, so don't worry how it looks if you use tape or staples. 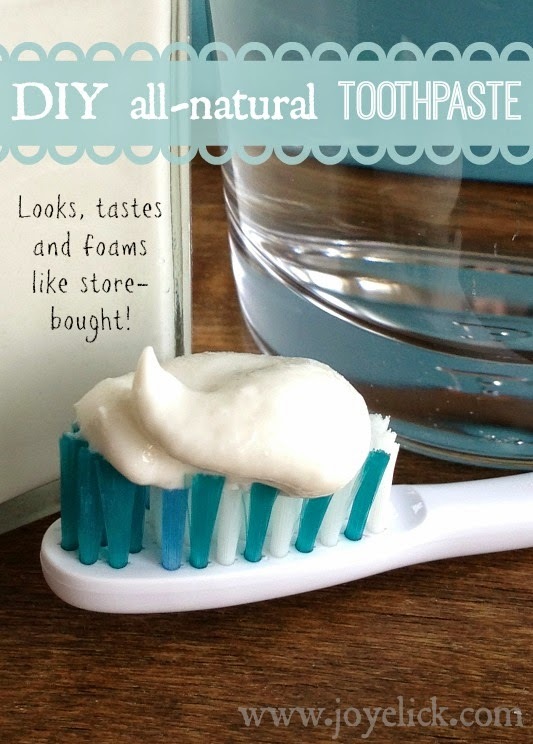 fold it up and glue in place. Now that you've made the cone, it's time to make the basket pretty! Glue the doily around the cone. Place the top edge of the doily about 1 1/2 inches (4 cm) below the cone's opening, so the doily hangs over the end of the cone. Flip the cone over and glue the doily so the edges meet down the middle at the back. Then fold the extra over the end and glue in place. Next, make a "Happy May Day" tag for your basket. Use a piece of black card stock to make a chalkboard look. With a white gel pen, draw an oblong shape about 2 X 3 inches (5 X 7 1/2 cm). Cut it out and flip it over, so the outline doesn't show. Then use the gel pen to draw white designs around the edge and write "Happy May Day." Make your "Happy May Day"
on it with a white gel pen. Remember: Do not write whom the basket is from--it's supposed to be a mystery! Since you're going to be hanging these on people's doors, you'll need to add a ribbon as a handle. The first thing you have to do is reinforce the spots where the ribbon will come through the paper. 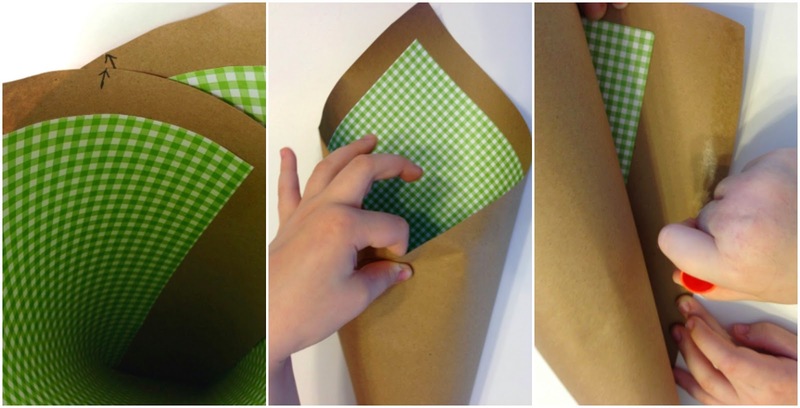 Cut two 1 X 1 inch (2 1/2 X 2 1/2 cm) scraps of the brown paper and glue them on the sides of your cone about 2 inches (5 cm) from the top edge. extra layer of brown paper. Using scissors, carefully poke a hole in the center of each reinforced square. Since the angle will be a little tricky, you'll probably want to do this step yourself. Now cut a length of ribbon about 16 inches (40 cm) long. Poke the ribbon ends through the reinforced holes you made. Knot the ribbon so it holds securely. You may need to knot the ribbon twice to be sure it won't pull through the holes. Knot the ribbon at both ends. Trim off any excess ribbon, and you're good to go. This final decorating step should be done after the ribbon is added and all the other handling is done. That way, the paint won't get smudged. 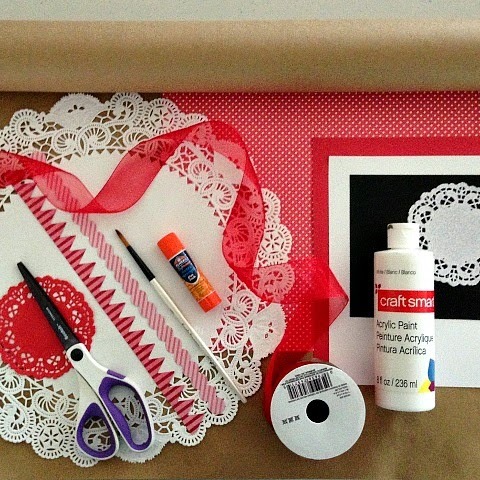 Using the white paint, touch the tip of a paintbrush to the brown paper just above the edge of the doily, creating a row of dots that follows the scalloped edge of the doily. This adds to the lacy look. When you're done painting, set aside the basket to dry. 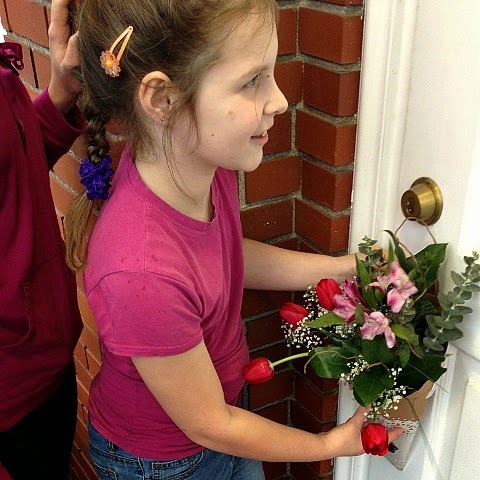 It's time to venture out into spring with your kids to collect flowers! Now comes the most beautiful part: gathering flowers and sharing spring with your community. 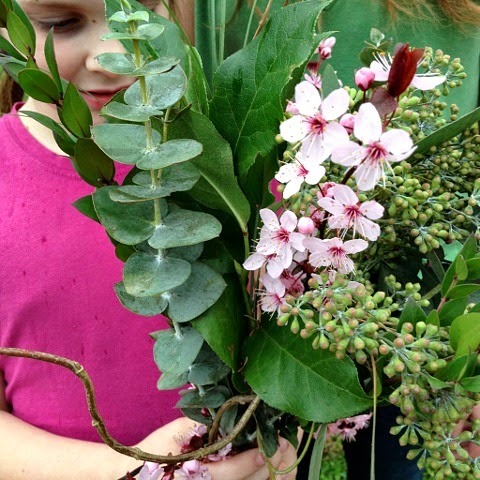 Take a nature walk with your kids and gather flowers and other greens for your May baskets. 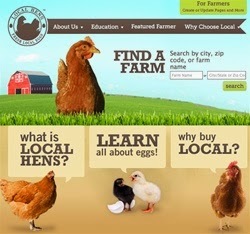 Explain to your kids that they can only pick flowers from certain places...not from the neighbors' yards. 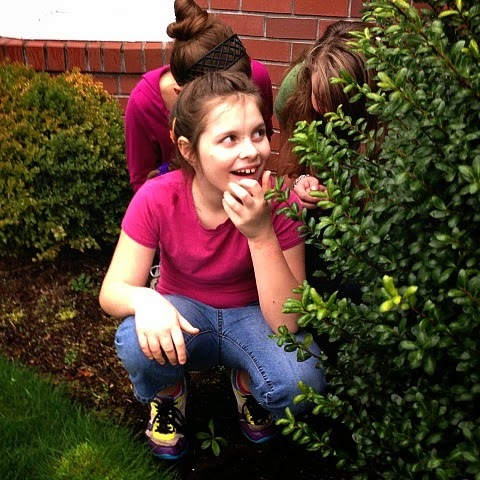 A nature walk is a really good way to help your kids connect with and celebrate spring, which is what May Day is all about. This part of the activity is also a nice opportunity to make memories with your kids. Frolic right alongside them, whether it's down a jogging trail, through a park, in an open field, on a school playground--almost anywhere things are growing. Note: If you live in the city or have limited space to pick flowers in your neighborhood, you can always go to a local farmers' market and buy flowers to put in your May baskets. No matter how you choose to gather spring into your baskets, once you're done, you'll be ready to spread spring around your community! No strangers. Obviously, your kids should approach only the doors of the people they know. Two is company. This is a family adventure, so be sure to go along with your kids as they go a-Maying. It's safer...and much more fun! Front doors only. It's customary to leave the May basket at the front door. Now, Grab your baskets and go a-Maying with your kids! Try not to make a sound! You and your kids will want to watch from your hiding spot as the person opens the door and finds their surprise. You better not get caught or you just might get a hug. Celebrating May Day will give your kids a glorious spring experience, which includes a craft, nature walk and outreach to family, friends and neighbors. Your kids will remember this holiday activity, not only for the blossoms on the outside, but also for the joy they'll discover blooming on the inside. So what do you think? Did you ever celebrate May Day as a child? Or is this the first time you've heard about this custom of going a-Maying? I'd love to hear from you in the comments below. Note: I originally wrote this article for My Kids Adventures. It first published on their website April 14, 2014. Now, it is being republished here.